"We really enjoyed our time staying at Leonora’s House for our 20th wedding anniversary. The villa is stunning with the most amazing view which you can never tire of..."
"We absolutely loved our holiday at The Rou Estate... The views from our villa were stunning and the villa itself was beautifully restored and decorated." "My stay at Emily’s House has been quite exquisite and it is quite frankly one of the best villas I have laid my eyes on... Agios Stefanos is right around the corner with many restaurants that will sensate your taste buds with Greek cuisine." "Rahi is a lovely villa in a beautiful location with always something to watch from every vantage point... Simpson Travel has once again done us proud." "Rahi and San Stefano are two of my wonders of the world. Our second time at Rahi and it was even better than our first. It will get better every time. I hope to come again." Away from Corfu’s well-trodden tourist trails, you can unwind to the gentle pace of Corfiot life at its most authentic. From Nissaki to Kassiopi in the north-east, hills silvered with olive groves sweep down to pebbly coves and quiet harbours, whilst sleepy seaside villages, such as pretty Agios Stephanos, lay on a welcoming choice of restaurants and accommodate late nights with laid-back gentility. The northern end of the island is also blessed with Corfu’s most beguiling views; its highest point of Mount Pantokrator surrounded by rugged terrain, rare flowers and ancient churches and monasteries. 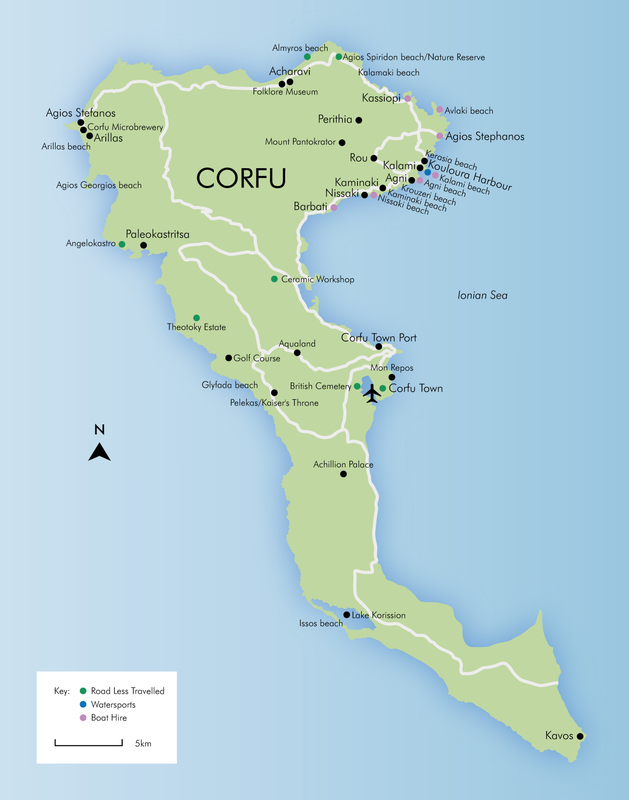 With a battle history as colourful as Greek mythology itself, Corfu surprises visitors with its many nods to the influences of rulers past. From the Venetian architecture of Corfu Town, a UNESCO World Heritage Site, to the Champs-Élysées-like elegance of the French-built cafe-lined promenade known as the Liston, there are plenty of reasons to tear yourself away from the undeniable charms of the coastline and simply wander. Such historic settings make a wonderful backdrop for a full programme of – usually free – live music and operatic events, which take place over the summer months. There are few Corfiot holiday activities as quintessential as mooching along the coast in a little boat and the narrow straits between north-east Corfu and Albania are usually calm. Equally, some of the secret bays that make such good spots for swimming, snorkelling and picnicking can only be reached by water. Your private vessel is also a wonderful vantage point from which to see a different side to the island. Take a literary pilgrimage to the former waterfront home of novelist Lawrence Durrell, or conduct a gourmet tour, with lunch at a traditional taverna for the day’s best catch and a carafe of wine. With its golden sands, gentle waves and clear waters, Corfu’s 200km of coastline is as kind to families as it is to couples seeking sunshine and sea air without the noisy hubbub of busy resorts. However, there’s more to do than unravel yourselves on a beach, as magical as that is. Following the clearly marked Corfu Trail around the island and you’ll discover its old-world villages, crumbling monasteries and secret hamlets. There’s also a riot of delicate wild flowers, rugged gorges, lush valleys and shady forests: a stunning natural landscape that’s remained unchanged for centuries. The local cuisine offers a typically Greek combination of simple flavours, home-grown produce and fruits of the sea to create one of the world’s healthiest diets – food that’s easily enjoyed from the terrace of your villa with a view to die for and skin still warm from the sun. A variety of small mezedes starts the proceedings. These divine dips include soft-roasted aubergine mashed with garlic, tangy feta cheese whipped with chilli, stuffed vine leaves and courgette flowers. The freshest meat and fish follow, cooked simply on the grill or baked to perfection. It is unthinkable to eat without a bowl of fresh salad drenched in olive oil; always seasonal and with few ingredients to ensure the taste of each shines. Although ouzo is Greece’s best-known tipple, you’re certain to come across Tsipouro (or raki). This clear grape spirit is potent stuff, typically served as a digestif. A glass of caramely, sweet Metaxa brandy rounds off a villa supper perfectly, especially sipped under a star-filled sky to a soundtrack of crickets. Lamb is the traditional meat in Corfiot cooking; feta cheese, fresh herbs and, of course, olive oil are other key ingredients. Corfu’s cuisine is inextricably tied in with its history and this is what makes the food here so different from the rest of Greece. The Venetian influence is strongest in the four best-known Corfiot dishes: sofrito (sliced veal cooked with vinegar, garlic and parsley); bourdeto (a peppery fish stew); bianco (a white, garlicky fish stew) and pastitsada (a pasta and meat dish). The island’s north-east coast has some very special places to eat; many on the water’s edge and easily accessible by car or boat – try the quaint fishing village of Agios Stephanos, where a meal in one of the harbour restaurants is the perfect way to unwind and sample traditional Greek fare after a day exploring the coastline. In addition to the more traditional tavernas where dishes such as freshly cooked moussaka and Greek salad with juicy sun-ripened tomatoes are commonplace, Corfu Town has a selection of fine dining options to choose from. Excellent for swimming, snorkelling and other watersports, this tranquil beach of fine shingle shelves gently down to blue-green waters within a picturesque village of just a few stone houses. 22km north of Corfu Town and a half-hour walk north of Nissaki, down a steep, winding track off Corfu’s north-east coastal road. There’s one beachfront taverna and another set further back, as well as a shower station located alongside the boat hire point. Framed by cypress and olive trees, this horseshoe bay is an idyllic spot with gentle waves and watersports including water skiing, wake boarding and ringo rides. A ten-minute drive south from Kassiopi, and Corfu Town is 30km away. There’s also a little jetty if you arrive by boat. The White House taverna at the water’s edge was once the home of naturalist Gerald Durrell, who wrote My Family and Other Animals about life in Corfu in the 1930s. Small and rarely crowded, this sand, shingle and pebble bay is popular for swimming, snorkelling and diving. Rock pools provide hours of play for older children. Nissaki is 22km north of Corfu Town, between Barbati and Kaminaki. There’s parking at the bottom of a quiet track, signposted from the coastal road. Its sheltered position and gradual shelving makes Nissaki ideal for young swimmers, though the water does become quite deep. Nearby tavernas fill quickly when lunchtime tours arrive. A popular beach for young families, with golden sands and lovely clear water that remains shallow for a long way out. Kalamaki is situated between Agios Spiridon and Kassiopi on the north-east coast and is accessed via a steep and winding road. Facilities stretch to sunbed and umbrella hire only, but paying customers are welcome to use the washrooms at the two beach bars and assortment of tavernas. The waterfront taverna’s lunchtime boat trip rush aside, this long beach is a crowd-free haven. Navigating its pebbles is easy thanks to walking boards laid along the wonderfully clear shoreline. Get there on foot or by car through the village of Agios Stephanos (east coast), or along the coastal footpath from Kouloura. Take an easy ten-minute stroll along the headland path to Kouloura harbour, where the fishermen will be busy preparing the day’s catch for the local tavernas. A narrow, sandy beach framed by picturesque headlands, with tavernas, two bars and watersports. It’s a little windier than some, but great for splashing in the waves. Lies just west of Agios Stefanos (a west-coast resort not to be confused with the north-east village of the same name). After a day on the west coast, stick around to watch the sunset at Arillas; take a stroll out along the peninsula between Arillas and Agios Stefanos to watch the magic unfold. A favourite with Kaiser Wilhelm II, the village of Pelekas is home to ‘Kaiser’s Throne’, a popular lookout spot offering dramatic sunset views across the island. Well worth the drive to the central-west coast, 25 minutes from Corfu Town. One of the joys of a Corfu holiday is hiring a motor boat and experiencing the island from the vantage point of the glorious Ionian Sea. You’ll be surprised how many isolated bays – many inaccessible by road – you’ll encounter along the way. You’re seldom far from a picturesque fishing village or quaint harbour with a smattering of tavernas where you can feast on traditional Greek fare and watch the world go by along the waterfront. Try Agios Stefanos on the north-west coast. A UNESCO World Heritage Site, Corfu’s Old Town was built between two fortresses and became famous for its elegant Venetian and French-style buildings. Stroll around Spianada Square, watch cricket on the esplanade and meander the maze of streets. The fashionable elegance of the Old Town’s Liston arcade is a throwback to French rule of the island. Take a morning beverage in one of the many stylish coffee houses, or an evening aperitif in one of the sophisticated bars. The lush vegetation, abandoned villages, secluded churches and undulating countryside make walking in Corfu exceptionally satisfying. Good maps can be hard to find, so ask our local representatives for suggestions. The views are breathtaking, the cool breeze refreshing on a hot day and you can take in the old Venetian-style stone houses with little to disturb the peace but sheep bells and birdsong. A drive to Old Peritheia ends with lunch under the oak trees. Find the freshest ingredients for your in-villa supper at Corfu Town’s market, where the catch of the day, a rainbow of fruit and vegetables, and olives stuffed every way imaginable are on display Monday through to Saturday from 8am until 2pm. Experience a wonderful vantage point from Corfu’s highest peak, Mount Pantokrator, 906m above sea level. There’s a charming monastery, little church and a handy café right at the top. Go easy on the road and take a windbreaker! Easter is the biggest event on the Greek calendar, marked by traditional processions, masses and feasting. The date changes each year and is often later than in the UK. The Ionian Islands commemorate their official unification with Greece which took place in 1864. The Gimari Festival near Kalami celebrates the name day of St Helen and Konstantinos with Greek music and local food and wine. The Nissaki Local Festival is held in All Saints Church, next to The Saints, one of our Corfu properties. It’s an evening of live Greek music and a barbecue with souvlaki pork and roasted lamb. The five-day Embody Dance Festival in Arillas offers classes in yoga, music, movement and meditation. Check dates, buy tickets and find out more at corfudancefestival.com. San Rocco Square Festival (in Corfu Town) is held in honour of St Spyridon, believed to have protected the island from plague. The Gimari Pie Festival is an invitation for the locals to get cooking and you can reap the benefits, with local wine to wash it all down, alongside an accompaniment of regional dancing. Every August, usually in the middle of the month, boats decorated in fairy lights sail up to Kalami beach to the soothing harmonies of a local choir, accompanied by guitars and violins. Varkarola Festival in Paleoastritsa celebrates the miracle of St Spyridon with much music, dancing and an impressive display of fireworks. The Corfu Beer Festival is an introduction to the culture, hospitality and gastronomy of the island – and, of course, the local beer! South of Platía San Rocco, this peaceful oasis contains the graves of soldiers killed during the British protectorate, and later became a resting place for expatriate families. However, few visitors expect that among the headstones they’ll discover around 30 varieties of Greek orchids (in bloom from the end of February until early June) as well as an abundance of daisies, hyacinths, cyclamens, tulips, snowdrops and even cacti. Along the national road to Paleokastritsa, in the centre of the island, you'll find the only traditional ceramic workshop in Corfu. The owners, Sissy and Sofoklis, have been creating handmade pottery on a wheel since the early 1980s. As well as watching the traditional methods in practice, you can buy kitchenware, kitchen and bathroom wall tiles and ceramic murals in the little shop. In the Ropa Valley, near the village of Giannades, the 300-acre Theotoky Estate is home to one of the oldest families in Greece. Most of the grounds are covered in pine trees, olive groves and vineyards, and daily wine and olive oil tasting tours also include a peek inside the owners’ magnificent private library, with its collection of over 35,000 books. High up above the coastline, this Byzantine fortress has survived numerous sieges over the centuries. There are plenty of lookout points on the road leading up to it, but nothing beats the view from the imposing ruins themselves. Take sturdy shoes and a bottle of water too. There are no facilities up there, so exploring during the heat of the day is best avoided. The island’s north is home to a lagoon with two openings to the sea; one found on the beach of Agios Spiridon, the other – home to the protected Lutra lutra otter – at the remote end of Almyros beach. Meanwhile, the Lefkimi salt flats – an hour south of Corfu Town – are rich in wildlife, and well worth the drive in early spring, when migrating flamingos flock here.